Sometimes the "Dutch" and the "Belgian" models of the boots are even confused during forums discussions. To clarify this issue, let's notice, that the Belgian boots feature three pairs of round eyelets below the hook-clamp for lacing, not two pairs, like the "Dutch" one. 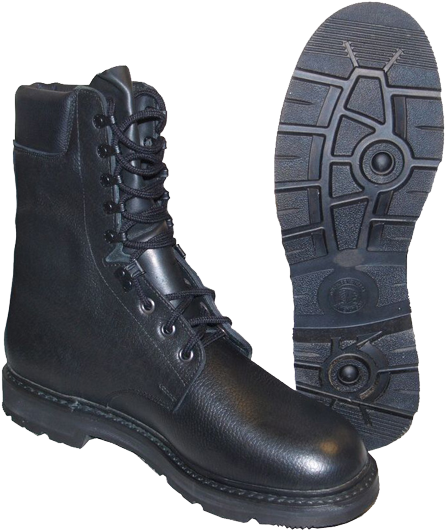 The "Dutch version" feature DMS (direct-moulded sole), and, of course, national ID-markings should be taken into account while identifying the manufacturing country of such boots. In the process of localization of faults and "weak points" detection, the Armed Forces of the Netherlands, together with the German Bundeswehr, began a gradual transition to the boots model developed by "HAIX" company, the so-called "Model 2005/2007" (Mark 5/6). 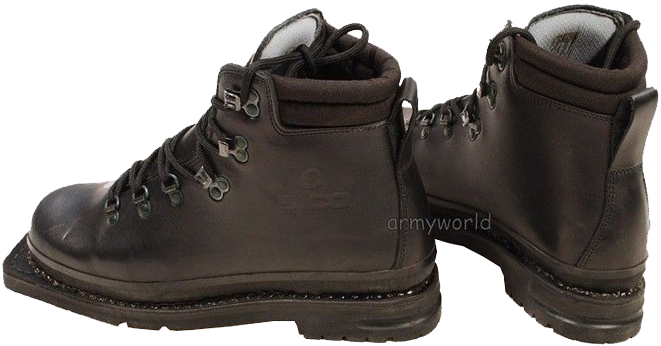 On the picture above one can see the Dutch military personnel in this new, high-quality, very convenient and constructively successful boots. They are well proven in a variety of weather conditions, especially in the European climate and awarded the best user reviews. 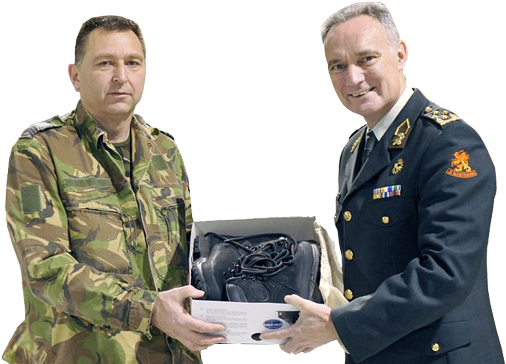 Currently, the Armed Forces of the Netherlands, following the latest trends in the development of army boots and taking into consideration the experience of the use of new models and footwear materials, solutions and technologies, are on their way to the new types of military boots. These boots are no longer of smooth leather, but are made of suede. The picture shows "Island MFS" model by German "Meindl" footwear company. For the mountainous terrain the Armed Forces of the Netherlands muses the boots, manufactured by "Alico Sport Di Altin F.&C. (SAS)", a famous Italian company from the city Chera di San Marco. 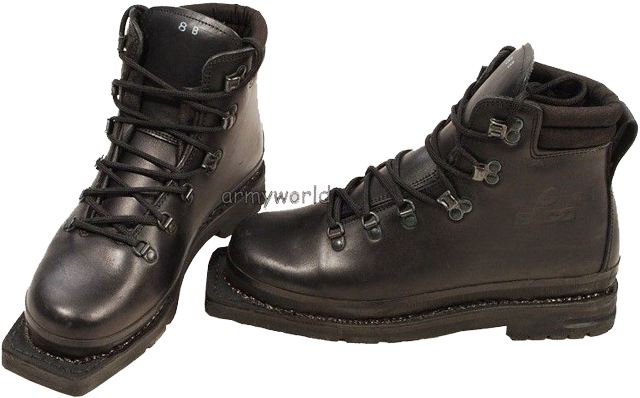 This short insulated boots are made of hydrophobic smooth black leather. The out-sole is a standard "Vibram" with classic tread pattern and additional stubs and grooves on the heels, intended for skis fastening. At the junction of the sole and leather upper these boots feature the reinforced rubberised bezel, a typical protective element for professional mountain boots. 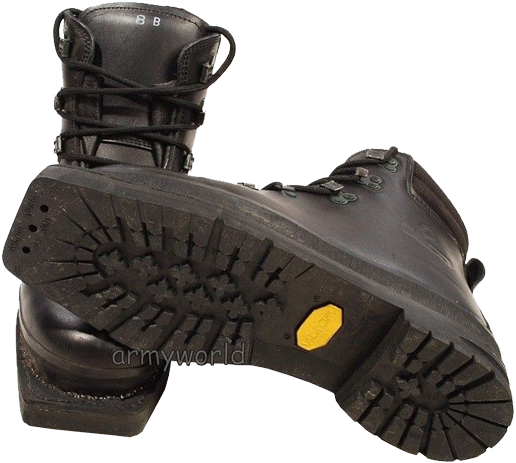 Structurally, these boots have minimal number of stitches, one can mention protective leather pad on the rear side of the boots and soft damping "collar" on the boot's top. The lacing system is provided by three pairs of "D" -shaped rings and two pairs of hooks for lacing.